A slip and fall can happen to anyone, anywhere. Whether they are in a restaurant or walking through their friend’s yard, the accident can happen and cause serious injuries and even death. 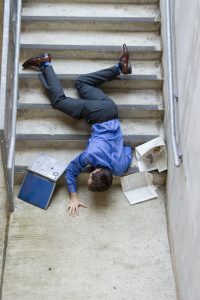 In the event that you or a loved one slips and falls at someone else’s fault is when liabilities should be considered. A liability can award you any compensation you need and deserve from the fall. Our attorneys in San Diego at Joseph C. Crudo, PLC can help you determine if you pursue a liability and win the compensation you deserve. A foot slips forward, causing the person to fall on their back. A food slips backwards, causing the person to fall on their front. A person trips over something and falls forward. A person is hit by an object. Obstructions on surfaces (wires, objects). Severe: back, spinal, knee, hip, head trauma, or death. What To Do If You Have a Slip and Fall? Take contact information of any witnesses. Notify the property owners of the fall. Contact us for legal advice. Determining the cause of the accident will help investigators point a finger in the correct direction. For example, if a restaurant has a wet floor without a warning sign and a customer slips and falls, the restaurant is clearly at fault. Our team of attorneys will figure out who to file the liability against, so all you have to worry about is regaining your health. Seeking compensation for your damages is our number one goal when filing your liability. The damages we can help you find support for includes: any current or future medical expenses, pain, suffering, rehabilitation therapy, lost wages, and support for care. When safety violations are in play, the amount of compensation becomes even greater. It is important that the situation has a complete set of evidence for the best possible case. Initiate a full investigation of the site. Document any conditions and secure evidence. Consult with expert slip resistance evaluators. Consult with experts for code and regulation violations. Represent your case and take you to trial if necessary. The law offices of Joseph C. Crudo, PLC has attorneys who specialize in personal injury cases, like slip and falls. We can provide you with a free consultation and give you the legal support you need to win back the damages you have suffered. Contact us by calling 858-622-7280 the moment you suspect your slip and fall is at the blame of someone besides yourself.